The National Air and Space Museum will receive Sean D. Tucker’s Oracle Challenger III high-performance aircraft for the future “We All Fly” exhibition. The museum has received a $10 million gift from the Thomas W. Haas Foundation for construction of the gallery, which will be named the “Thomas W. Haas We All Fly” gallery in recognition of the foundation’s gift. 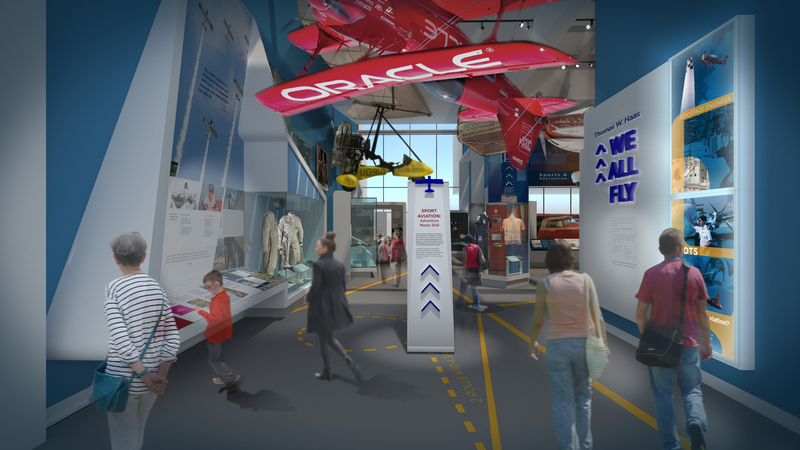 The Oracle Challenger III will be displayed at the entrance to the gallery, the first exhibition at the museum in more than four decades to be dedicated exclusively to general aviation. Since the 1970s, Sean D. Tucker has proven himself as a legend in aerobatic flight having flown more than 1,300 performances. In 2003, he was named one of 25 Living Legends of Flight by the National Air and Space Museum, and in 2008, he was enshrined in the National Aviation Hall of Fame. For the past eight years, Tucker has flown the Oracle Challenger III, a custom-built biplane that uses the latest advancements in technology from aerobatic performance airplanes, drag racing and sailing. Displaying the Oracle Challenger III in the gallery will showcase the technological achievements of the aircraft, including its eight ailerons that enhanced maneuverability and the engine’s cold-air induction system and state-of-the art fuel injection. Scheduled to open in 2021, the “Thomas W. Haas We All Fly” gallery will give visitors an opportunity to explore a variety of people and fields within aviation, highlighting themes such as sport, private, business, humanitarian and utility flight. In addition to the Oracle Challenger, aircraft such as a Cessna 180, Gates Lear Jet and a Cirrus SR22 will be displayed. The exhibition will feature new educational interactive technology and engaging videos that will explore the valuable impact of general aviation on society and encourage the public to join in. For more information about how the museum is transforming all of the exhibitions and revitalizing the building, visit https://airandspace.si.edu/reimagining-air-and-space. The National Air and Space Museum in Washington, D.C., is located at Sixth Street and Independence Avenue S.W. Washington, D.C. The Steven F. Udvar-Hazy Center is located in Chantilly, Virginia, near Washington Dulles International Airport. Both facilities are open daily from 10 a.m. until 5:30 p.m. (closed Dec. 25). Admission is free, but there is a $15 fee for parking at the Udvar-Hazy Center. Sean D. Tucker donated his custom-built biplane, the Oracle Challenger III, to the Museum for display in the future "Thomas W. Haas We All Fly" gallery, slated to open in 2021. Displaying the Oracle Challenger III in the gallery will showcase the technological achievements of the aircraft, including its eight ailerons that enhanced maneuverability and the engine’s cold-air induction system and state-of-the art fuel injection. Artist rendering of "Thomas W. Haas We All Fly" gallery, slated to open in 2021 at the National Air and Space Museum in Washington, DC.